If you’re looking for a great subscription box for men, look no further. Bespoke Post offers a variety of boxes for men with different products to choose from each month! These include items for the home, grooming products, kitchen items, clothing, accessories, products for people with particular hobbies (like drawing), tech items, and more! With all these options, there’s bound to be one for any type of guy. Even though there are so many different box types, they make it simple by pricing each one at $45 with free shipping. If you don’t like any of the boxes they’re offering for a particular month, you can simply skip it (or cancel) and wait to see what they offer next month. Their box options are always changing. 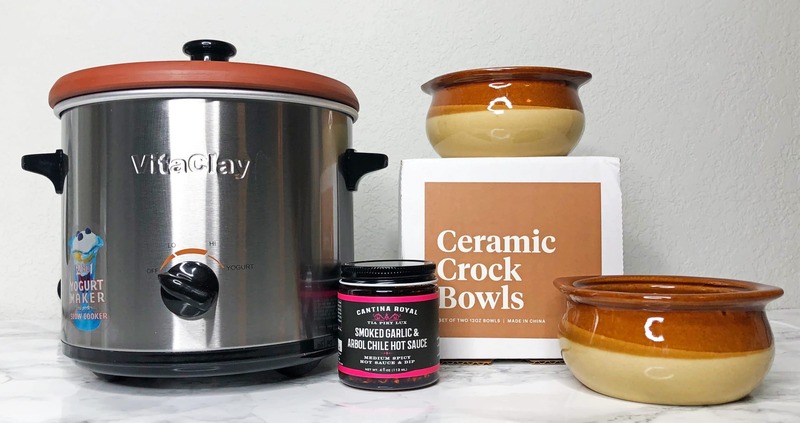 This Bespoke Post review shares the Hearth box! This came with a few items for the kitchen, which you’ll see in further detail below. If you’re interested in other types of products and boxes, check out my previous reviews of some of their other curated boxes! My November box arrived in a pretty large Bespoke Post box. Although I usually let them pick a box for me because I like surprises, I peeked this month and had to choose the Hearth box. This contained a slow cooker, two crock bowls, and a container of hot sauce. It was new this month, and it’s already sold out! I’m glad I got it while I could. 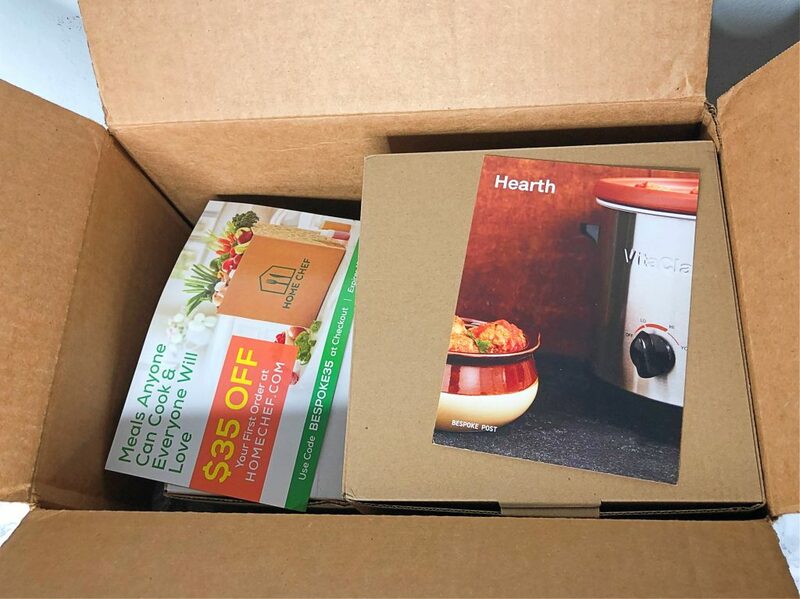 On top, it came with a coupon for Home Chef (which I already subscribe to) and a sheet that described the Hearth box. Since there were breakable items inside, I’m glad they did such a good job packaging it. There were separate boxes for a couple items and lots of bubble wrap. This might just be my favorite Bespoke Post box so far—check out my reviews of each product below to see why! Surprisingly, I’d never used a slow cooker before. Once I used this, I couldn’t believe how easy it is. You just throw the food in, and it cooks it! Although it does take a few hours, it’s great for meals that you plan to eat later. I’ve forgotten about the food I’m cooking numerous times until I get hungry, and by then it’s ready for me to eat. There are so many recipes you can make with this—such as soups, rice, curry, and many others. This one even has a yogurt setting, which I’m looking forward to trying out. 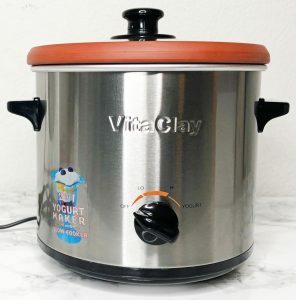 Another great quality of this slow cooker is that the food is cooked in a clay pot. Clay is known to enrich the flavor and texture and make nutrients easier for the body to process. Not only that, but it’s much safer than the popular slow cookers that are lined with aluminum, Teflon, or other materials that aren’t as healthy to consume. Some clay pots pose the risk of lead contamination from how they’re treated or glazed, but VitaClay pots are unglazed and have been certified as lead-free. It’s also very easy to clean and is dishwasher safe! 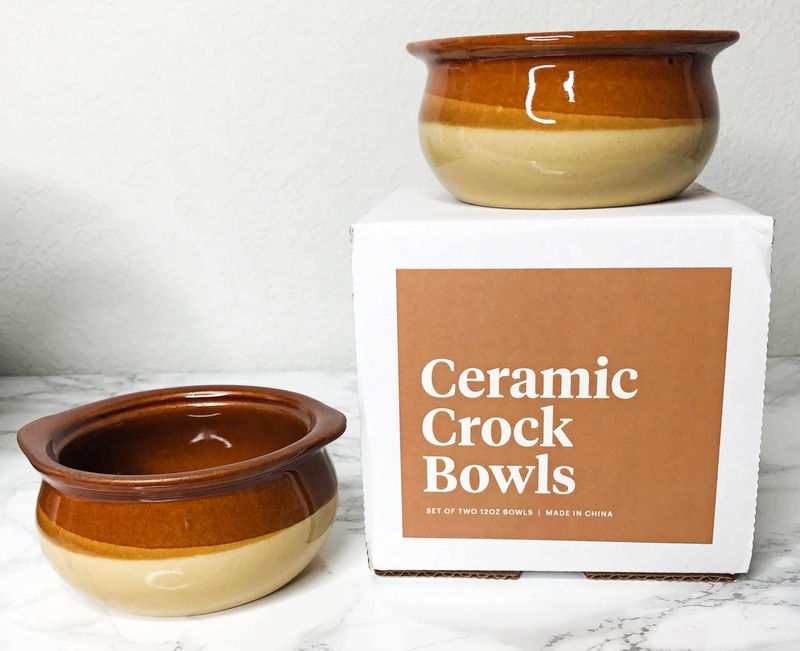 In addition to the slow cooker, my box came with two of these beautiful crock bowls. Not only are they gorgeous, but they’re oven and dishwasher safe! They’re very thick and tough—I bet I could drop them and they’d be fine. They looked small at first, but they held more food than I expected. Overall, they’re a great addition to my kitchen. This hot sauce was a nice final addition to the box. I loved it. It isn’t too spicy, with just the right amount of heat. It came in a nice, high-quality glass container. This can be added to a recipe for extra heat or even used as a dipping sauce! As I mention in every Bespoke Post review, they offer a coupon for new subscribers: 30% off your first box! The promo code for this is RESCUE, which you’ll need to enter at checkout. In addition, their shop has a variety of deals and sales. They’re changing all the time—the only way I can keep up is through the emails they send me. 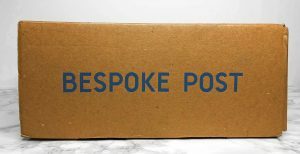 Although Bespoke Post has the largest variety of boxes, there are plenty of other subscription boxes for men. 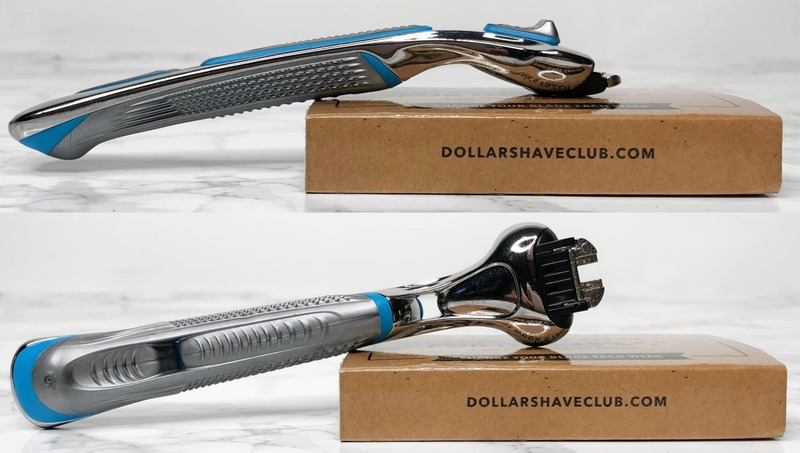 For example, Dollar Shave Club is a popular choice among men (and women as well) that provides inexpensive, high-quality shaving supplies. If you want to see more subscription boxes for men, we even have a list dedicated to the best ones! Here, you’ll be able to find a large variety of boxes that are tailored toward specific products or hobbies (such as sports, fishing, watches, accessories, clothing, outdoor gear, golf, and so on). Once again, I was very happy with this month’s Bespoke Post box. The curation of their boxes have been perfect, and the items are of high quality. Plus, you’ll always receive a higher value of items than what you pay. I’ve never been disappointed by a shipment! There is such a variety of box types that there will almost always be an option for somebody. Overall, I definitely think this subscription is worth it.